crocheting is one of the oldest needlework arts. its name is derived from the french word “croche” meaning a hook. even a novice can crochet intricate laces and designs for tablecloths, doilies, scarves and other household furnishings, as well as various fashion items. crochet is easily mastered; only two items are essential-a crochet hook and thread or yarn. 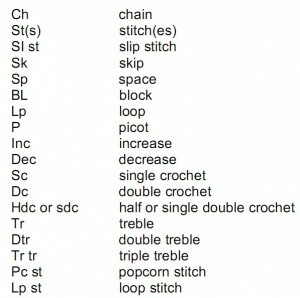 all crochet designs are variations of a few basic crochet stitches. an asterisk (*) means that the directions immediately following are to be repeated the given number of times in addition to the ones already given. thus “repeat from * 3 times” means 4 patterns in all. instead of using the asterisk, directions may appear in parentheses, such as (ch 8, sk 2 sts, sc in next st) 4 times. this means to work the directions in parentheses the number of times specified at end of parentheses. to work an “even” row means to work row without any increases or decreases.